This delicately layered poem builds upon the Persephone myth (briefly told at the beginning of the poem) to reflect on the universal experience of losing a daughter to adulthood and marriage. 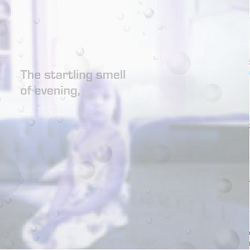 The visual image in the poem seems to be from a Demeter-like perspective as she sees the faded memory of her little girl, with muted colors and seemingly underwater. The poem progresses by gently directing readers to move the pointers over certain parts of the image, which triggers brief sound and textual sequences that explore the speaker’s state of mind. We also get layers of other images fading in and out, of a grown young woman and a bare field, both of which allude to the myth. This is a powerfully archetypal poem, using the technology to evoke a moment that should resonate with parents of grown children everywhere.